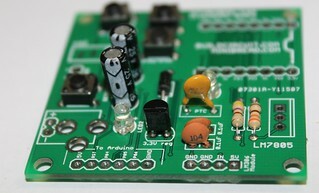 This post shows you how to assemble the WTV020SD-16P evaluation board. You can get full description of this kit on this page. The assembly process is straight forward. It can be easily assembled if you follow the silkscreen indicators(labels) and have beginning experience with a soldering iron. 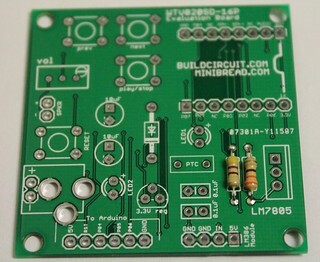 You will need to read the resistor bands or use a multimeter to determine the resistor sizes. Bare PCB with silkscreen indicators. 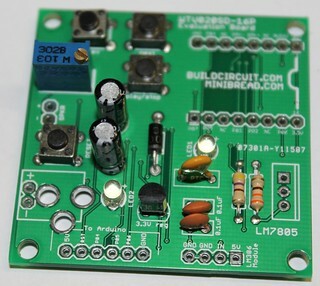 You need would other components that are not included along with the kit package and you need to buy those separately. You can get full description of this kit on this page. Now, you can start the assembly process. We have skipped some steps on this post. If you want to see all the steps, please check this tutorial. Step 1: Solder resistors 330R and 470R. Step 2: Solder 2 pcs 0.1uF ceramic capacitors, 3mm LEDs, 3.3V regulator and 1N4001 diode. Step 4: Solder all the tactile switches. Step 5: Solder 2 pcs 10uF capacitors and 300mA resettable PTC fuse. Step 6: Solder 500 Ohm variable resistor. The image shows 103 (which is 10K) which is incorrect. We send you 500 Ohm variable resistor. Step 8: Connect a 8 Ohm speaker and solder 2pcs of 8 pin female header for stacking the WTV020SD module. 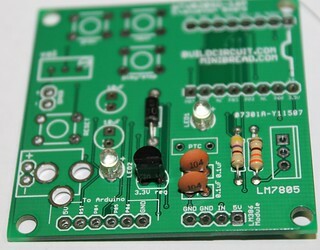 Step 9: Solder LM7805 regulator chip. Step 10: Stack WTV020-16P music module over the female headers. Your evaluation kit for wtv020sd module is ready. 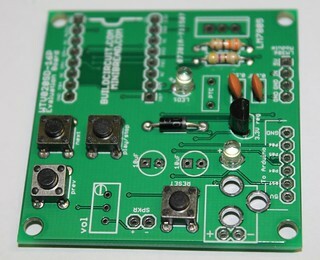 Simply, power the board with a 6-9V power supply and play AD4 format music files. 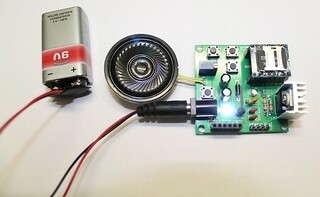 You can connect an LM386 based audio amplifier to the kit. The amplifier will amplify the audio for you. 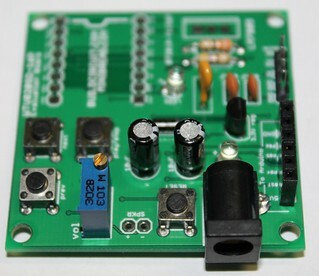 Click here to watch the video of the kit with the audio amplifier connected. Download the AD4 audio sample files.